Dusseldorf, 15 October 2013 – At the K 2013 trade show, Kistler is presenting systems which significantly reduce the ‘cost of poor quality’. In addition, Kistler will showcase fresh innovative sensor technology for reliable mass production of lightweight components for the automotive industry. Kistler will be presenting the COPQ tool for the first time at K 2013, which will help to contrast the ‘costs of poor quality ‘ (COPQ) with the cost of investing in Kistler products. For each project, the tool calculates a Return-on-Investment (ROI) of the Kistler systems. It can be tested at the Kistler stand during the show and will subsequently be available to Kistler customers on its website, free of charge. Kistler assures 100% quality and zero defect production in all injection molding processes. Kistler sensors and systems can measure and analyze cavity pressure during molding, monitor the process and reduce rejects or separate them immediately upon production. By integrating quality assurance in the actual injection molding process, the costs associated with poor quality can be significantly reduced. Reproducible mass production of lightweight structures is a key technology for the future advancement of mobility in various industries – with specific focus on automobile, aeronautical and space technologies. These structural components are manufactured with a thermoplastic or thermosetting matrix in various processes. This includes forming and back injection molding of organic sheets, injection molding (or pressing of long glass fiber-reinforced thermoplastics), as well as resin transfer molding (RTM) and sheet molding compound (SMC). The production of lightweight and composite components place special requirements on process monitoring and quality assurance. The key to these processes is reproducible mass production of molded parts. For the last forty years, Kistler has been a sought-after partner in the development of new processes and applications with its sensors and systems for measuring and analyzing cavity pressure. With a portfolio of world-leading products, Kistler offers optimum sensor technology for every process, from compact injection molding, to special procedures in injection molding technology, through to RTM. The new RTM sensor ensures that filling errors and deviations from the optimum process sequence can be identified and also that cascaded filling operations can be managed for large molded parts. As well as measuring pressure, the new sensors facilitate measuring of the vacuum in an evacuated tool. They record all process states and provide an important contribution to increasing process transparency and ensuring molded part quality in the production of lightweight components. Kistler will be presenting its new cavity pressure sensors at K 2013. 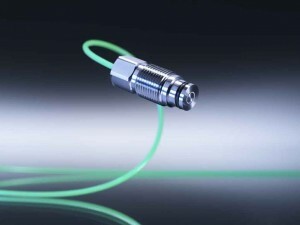 Pioneering innovation in this field, Kistler has developed new sensors with a front diameter of 1 mm and 2.5 mm, which will be available in two variations – with an exchangeable cable and as a cable-less variety. This provides greater flexibility when using these sensors as well as easy repair of damaged cables. In addition, a miniature measurement pin for contact free measuring of cavity pressure is also provided, which can be used in the production of parts with high optical requirements and confined working environments. The new strain transmitter for electrical injection molding machines is used for simultaneous clamping force measurement and protection. The new mold technology showcases Kistler’s continued evolution of sensors into high-speed injection molding machines and is an example of its commitment to innovation through R&D. Thanks to the particularly sensitive mold protection monitoring, optimum protection for all tool components is guaranteed.Kistler is presenting its innovations at K 2013 in Dusseldorf, Germany from 16 to 23 October 2013 at Stand F04 in Hall 10.